If your checkout page is showing this message, is simply blank, or is redirecting to another URL instead of your cart, then we’ve got the answer for you below. It’s because you’ve got a countdown timer set on your product, which has now expired. You can find out information on countdown timers here. 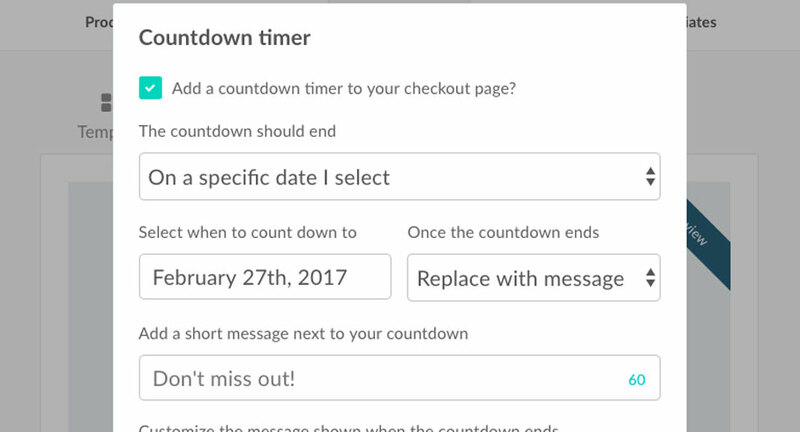 For example, the following countdown timer settings would display the message above should I try to visit the cart on the 28th February 2017 or at a later date. To resolve this you simply need to disable the countdown, or a set a new future date you want the countdown to expire at. In the case of the quantity limit being the reason, you’ll need to increase the quantity available for your payment option or allow unlimited copies to be sold. You can find out more on this here. If you need any further assistance please don’t hesitate to get in touch with us directly.